The NH Collection Florence Porta Rossa is thought to be the oldest hotel in Italy, complete with a 13th century tower and ancient frescoes. The hotel’s location has a storied past. Letters, dating back to 1386, were located by historians that mentioned “Locanda Porta Rossa.” The first building to stand there served as Florence’s inaugural municipal building, and is the origin of the building’s immense tower. After a clock was placed in the tower in 1407, its name was changed to Dell’ Oriolo. Another structure was built on the land in the 16th century, and the designs incorporated the original 13th century tower. The Torrigiana family owned the palazzo beginning in 1559 and lived there for over two centuries. They eventually rented it out to an enterprising group of hoteliers in the first half of the 19th century. The hotel’s 72 guestrooms are the epitome of sophistication, fusing old-world charm with modern furnishings in ivory cream and brilliant red. Inside the hotel, guests can find the restaurant “Truffle Experience,” run by the Savini family, whose passion for truffles lasted over four generations. Diners will be able to indulge in classic truffle and regional Tuscan dishes. Other guest amenities include complimentary WiFi, pet-friendly accommodations, a business center, and intimate meeting spaces. 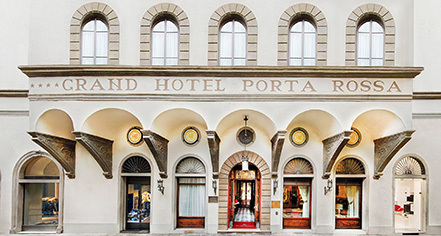 NH Collection Florence Porta Rossa sits in the heart of Florence, Italy's historical center. Adjacent to the Piazza della Signoria Square, the hotel offers a location in walking distance to many of the city's notable landmarks and attractions such as the Fountain of Neptune, Duomo, Uffizi gallery, and more. The culturally-rich area is filled with exceptional art galleries, unique boutique stores, and quaint cafés on Via dei Tornabouni. NH Collection Florence Porta Rossa, a member of Historic Hotels Worldwide since 2017, dates back to the 13th Century. The windows of the hotel bear an inscription, in Italian, Per non dormire ("[A reward] For not sleeping"), the motto of the Salimbeni family, the first owners of the ancient palace. Cancellation Policy: Varies by reservation type; please check with hotel before booking. Early Check-In/Late Check-Out: Available depending upon availability; rates apply. Extra Person Fees: Fees vary, dependent on type of room or package booked. Hotel/Resort Fees & Taxes: €4.50 per night per person. Occupancy Restrictions: Maximum 3 persons. Parking: On-site parking is available. €26 / day. Payment: Visa, MasterCard, and Amex are accepted. Pet Policy: Pets allowed; fee is €20; no charge for guide dogs. Smoking Policy: Smoking rooms available upon request. The NH Collection Florence Porta Rossa is thought to be the oldest hotel in Italy, complete with a 13th century tower and ancient frescoes. The hotel’s location has a storied past. Letters, dating back to 1386, were located by historians that mentioned “Locanda Porta Rossa. 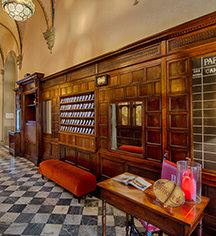 Learn more about the History of NH Collection Florence Porta Rossa .